The 1920s and 1930s were characterised, in automotive terms, by the steadily increasing speed of travel. The development of fast roads ways and long-distance routes reflected this change, while the era also saw the advent of the motorway. The automotive industry took advantage of this progress. And not just with more powerful engines and redesigned suspensions: vehicle bodies, for example, grew more sophisticated in design, while streamlined vehicles also emerged. Against this backdrop, Mercedes-Benz built several vehicles with aerodynamically shaped bodies – the 540 K Streamliner being one of them. 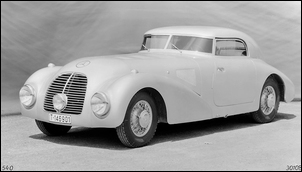 The 540 K was Mercedes-Benz’s sporty top model in the 1930s and the 540 K Streamliner was produced in 1938. 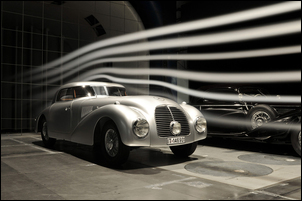 The styling experts at Mercedes-Benz created a whole series of aerodynamically shaped body shells for the 540 K during 1937 and 1938, all of which reflected the concept of aerodynamic flow. The Streamliner was not only a masterpiece of design, but also demonstrated the most thorough application of the knowledge gained in the tests in the wind tunnel. So a more streamlined body with a considerably improved Cd figure was required. 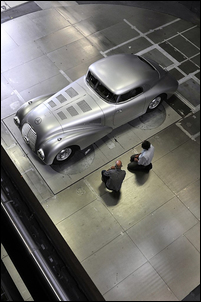 The 540 K Streamliner met the criterion, as wind tunnel measurements undertaken by Mercedes-Benz in 2014 showed: the car achieves a Cd of 0.36. The results are cruising speeds of 165 to 170 km/h and with supercharger, a top speed of 185 km/h. 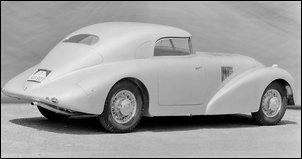 The 540 K Streamliner was systematically designed to meet the aerodynamic specifications: shaped from front to rear to allow the air to flow perfectly over it and to offer as little resistance as possible to the wind. The windscreens are curved to the sides. The roof line is set low, tapering to a point in the middle of the back and merging from there into the horizontal line of the softly curved rear section. The headlamps are fully integrated. At each point where the air flow risks breaking away, the designers have optimised the details, for example by recessing the door handles, omitting the bumpers or reducing the panel gaps. The underbody is completely panelled, so minimising obstructions to the air flow here too. The requirement to achieve high cruising speeds also dictated an adjustment to the drive axle ratio, which was lengthened from 3.08 to 2.90. In all other technical details, the car matched the standard version of the 540 K.
The extraordinary 540 K was built by the special vehicle production unit in the first half of 1938. In June it was delivered by the Daimler-Benz dealership in Frankfurt am Main to the Deutsche Dunlop Gummi Comp AG (German Dunlop Rubber Company) in Hanau. The company put this high-performance vehicle to specific use for tyre testing, as the ever-higher speeds at which cars were now travelling demanded new designs and materials for tyres that would enable them to withstand the more powerful forces to which they were exposed. These had then to be subjected to real-life testing, which was all the more necessary for powerful, heavy and fast cars. And so the 540 K Streamliner really came into its own. Far more so than any other vehicle of that era, its aerodynamically styled body and powerful engine made it eminently capable of rapid supercharged acceleration to speeds as high as 185 km/h on the – in those days still very empty – German autobahns. 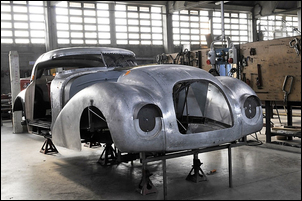 The restoration of the 540 K Streamliner represents one of the most complex projects undertaken by Mercedes-Benz. The starting signal was given at the end of 2011. 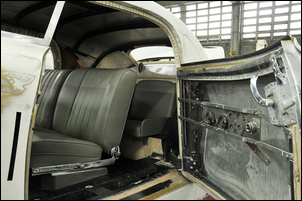 Some important components of the original vehicle were preserved among the company’s own collection, for example the complete frame and the rear axle. But of the most important component of this unique vehicle only traces remained on the frame: the streamlined aluminium body. The project began to take shape at the point when the Mercedes-Benz Classic Archives made the original line drawing from their collection available. This established the precise dimensions of the vehicle. But you can forget ‘standard’ in the case of the 540 K. Virtually every part that no longer existed, and every detail, needed to be individually made or tracked down in the Mercedes-Benz Classic collection. Documents were brought to light, for example the original quotation drawing for the streamliner. Old photos appeared – not many, but each one of them a tremendous help along the way to achieving the perfect result. High-resolution scanning of the original glass negatives from the 1930s, for example, revealed the minutest of details, such as how the historical number plates were made, the shape of the dashboard and even the position of the screws used to mount the wooden trim in the interior. Further information was provided by the parts lists and owner’s manual for the 540 K.
Time and time again the project involved the experts trying to work out the construction techniques of the 1930s, since no details or production steps for the body shell were to be found in the documentation. The remaining parts – the frame, the rear axle with its longer gear ratio and the mountings for the wings – were repaired and preserved. They bear to this day the marks of time and so tell the story of the vehicle in their own way: signs of wear and tear, for example, show that the vehicle was not treated by Dunlop with any particular respect during tyre testing. Drill holes show how the underbody panelling was attached to the frame. And then there are the traces of paint: once upon a time, the vehicle was silver. The traces that remain provided the basis for mixing paintwork to match. Just as it was in the 1930s, the vehicle was assembled in the classic way: a steel frame holding all the technical elements is surmounted by an ash-wood subframe that supports the body shell. Some 4800 hours of work were involved just in rebuilding the body. Aerodynamics experts from the present-day passenger car development department at Mercedes-Benz provided advice on the reconstruction of the underbody panelling. Its design was determined by the original mounting points, as found on this special vehicle only, and is almost completely enclosed, with only ventilation slits under the engine, transmission and exhaust system. Very little historical information or photographic material relating to the interior is available. What little there is was used, but in this case the reconstruction required considerable expertise. One thing is clear: the dashboard is curved in order to fit within the contours of the occupant compartment – and, just as then, it has once again been made produced in walnut. The same contours are followed by the two curved windscreens, reproduced in glass. The historical evidence tells us that the vehicle originally featured grey leather appointments with a grey fabric roof liner - the Streamliner now looks this way again. The two seats in the front correspond to the original, including the way the piping runs across the appropriately ruffled leather. Technical drawings show that folding seats were mounted in the rear – new ones have been created. Truly a magnificent car, now again looking as it should.